The Minnesota Forecaster: A Final Later Winter/Early Spring Curve? Not sure about the "almost has" to be the last snow Bill. Remember it snowed here in May last year. Oh that's right, you are in California! Back to the weather, happy that down here in Shakopee it looks like under 1" is predicted so far. Yep, even though I'm in California AND lived through the snow thru early May last year, it still seems -- in my heart -- that this has to be the last of the snow. But what do I know. Giving you a hard time Bill because my golf clubs are crying. At 5 AM very windy and looks like a mix hit over night. Should be a fun rush hour. Sounds like the consensus fits in well with where Randy is going with his 4cast. 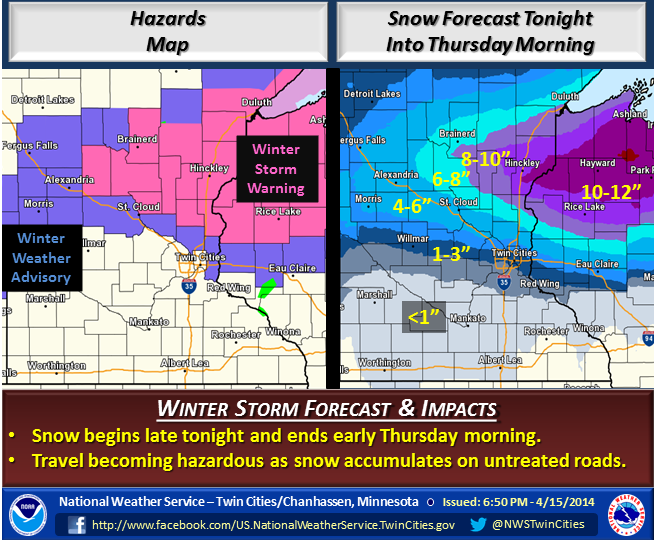 No doubt a sharp, SHARP gradient to the snow totals across central MN & No. WI, incl. the MSP metro. I won't be surprised if a 6"+ N to S snow gradient is found across the metro. For instance, Anoka county 6"+ while Dakota county receives mostly rain. I won't be shocked to hear of totals exceeding 12" in the Pine City, Siren, Spooner, Hayward areas. Assuming this storm goes as planned, that's what? one 'direct' hit...meaning the center of the bullseye...on the Twin Cities for the entire Winter (Feb 21) and about 100 near misses. We got 70" of snow and it was still frustrating. On second thought, you're right. We weren't in the bullseye for the Feb 21 storm either. Randyinchamplin you very well maybe correct with your prediction but were expected to believe 7-10" will fall on northern Hennipen county when there isn't even a warning/advisory in ANY part of Hennipen county. Is the NWS that out to lunch? I find it very strange that Hennepin and Ramsey counties are omitted from the warning/advisory headlines....if you draw a straight line where the advisories are to the west and east of those counties, its like those two were purposely omitted. NWS can not be that precise with this snowfall, my area of Maple Grove is forecasted for 3-5" and that doesn't warrant any headlines? for the twin cities metro...low level dry air will push well north of the iowa border and keep the metro relatively quiet through the morning. by the time saturation is achieved...it will be warm enough for purely rain to fall. IR satellite loop is impressive. Cloud tops are cooling rapidly over so/central MN. This thing is exploding overhead. Don't be surprised if St. Cloud, Cambridge, Hayward WI, start reporting snowfall rates of 2"+/hour this afternoon & evening with ThunderSNOW. Impressive snow gradient across the metro likely. Heavy Snow in EP right now. The wind map at http://hint.fm/wind/ is pretty awesome right now. Thats funny.....now after a quick burst of heavy snow in Golden Valley that laided down an inch maybe I see Hennipen and Ramsey were added to advisories.....but looking at radar everything is lifting north....currently snow has ended....this system keeps on baffling everyone. Are my eyes deceiving me? It looks like it just took a dip south with heavy snow now over the metro. A warning now for Hennipen......this is crazy....from nothing to a warning....Novak this must be the surprises you talked about. Only a ice cold moderate rain, with a bit of sleet mixing here in Woodbury. Randy hit this sucker right on the nose. I think he should be in front of the camera or working at the NWS. Nice job my friend! Impressive. Truly amazing storm to hear whats going on in other parts of the metro(including you Bill) like Woodbury and Shakopee.....its been snowing pretty hard for the last 3 hours in Golden Valley and I just measured 4"......too bad my snow bowl ended...I needed 7" for a victory....6 days too late. April 10 was a agreed upon end date....it doesnt go till the last flake flies.....because MN snows could start early and go late....so to try to make it fair we agreed on Dec 1st till April 10 with a 20" spread....I didnt image he get 65" this year...final tally on April 10 was 78-65. I agree with Bill and Novak's comment on his site. A look at the traffic cams is amazing in terms of the differences on the northern side of 394 v south/east metro. 0'' in South Minny. Light rain. This is a great spring 'rain' any way you slice it. For those who got snow, it's a slow motion downpour. Like Novak said expect surprises.....this storm continues to baffle.....Im speaking for my residence in Gilden Valley because the weather is differnet around the metro....so we got snow earlier when it was forecasted to be rain.....we went from no headlines to a advisory followed by a warning.....we accumulated 4" of snow and now.......a heavy sleet falling for an hour when it was forecasted to be snow.....what a head shaker.....nowhere did I even hear sleet out of anyones mouth....a good 1/4" of it......and to think were already a month into spring.....I bet we hit 80 next week.....from winter to summer with a few days of spring in between......thats Minnesota.....like Novak says never a dull moment!.....Sorry Bill but I'll take this over the boring California weather! This is how crazy this storm is. Ramsey 11", Maple Grove 7.5", Champlin 9", and lovely Shakopee heavy rain as of 9:15 PM (no snow on ground). I live 31 miles from Champlin. Dr. Novak this is crazy. Storm seems like it will be out of here by 11 or so looking at the NE movement and seems like more heavy rain coming for Shakopee (Prior Lake/Savage border). Heavy snow again in Golden Valley....snowing hard for the past 1 1/2 hours! Had a very interesting drive from St. Paul to St. Louis Park this evening around 9pm. At Lexington and Summit, nothing but a very steady rain. I had wet roads, no evidence of snow or sleet, all the way west to the Lowry tunnel. But from the tunnel until I was on 394, the road changed from wet to slush covered and the rain changed to sleet...all in about a quarter to half mile distance. Gotta say it's fun to monitor a snowstorm with everyone's comments and the traffic cameras -- as I (sorry) sit at my computer in shorts, a t-shirt and sandals. So what's with all the excitement? With the exception of a brief period of wet snow late yesterday afternoon, which turned to rain, we got zero snow here in Rosemount. It was a cold, windy, rainy night. It's hard to believe that so much snow fell a short distance away. Talk about being on the ultimate rain/snow line. As a snow fan, I was not happy, but it is mid-April and it looks like a very nice spring week is shaping up for us next week! Let's enjoy the warm weather for awhile, and then hopefully enjoy another great winter next season! Weird to have my county (Hennepin) in a WSW and just get rain with half inch sloppy snow overnight in Minneapolis. Nothing more was expected in Minneapolis. The problem is they can't just issue a WSW for a part of a county. If they could it would have only included Northern Hennepin County where places like Maple Grove got almost 8 inches. I am curious as to why that is: they can and do issue severe thunderstorm warnings, tornado warnings, even special weather statements for portion of counties. I am baffled they can't do the same for WSW. We are in 2014 not 1940! Isanti looks to be the winner with 19 inches. Golden Valley.....also in Hennipen county checking in with 7 very wet inches on the driveway.....my back is feeling it and all I did was the steps.....shear bolt broke on snowblower during our last April snowstorm...so I said mother nature can melt it for me till next winter.....then we get hit with 7 more inches last night. MSP couldn't even manage the .5" it needed to his 70" total for the season. My thoughts on our last winter system on the season.....it was truly an amazing storm that over achieved and exceeded even the highest forecasts in our CWA(20" North Branch) and also I am still amazed how a sharp gradient from rain to snow can setup in one county , in Hennipen County for instance in Golden Valley I got 7" and the MSP airport got .3"......thats like a 25 minute ride. And finally I would like to acknowledge the awesome job/forecast that Randyinchamplain delivered.....nice call with the dividing line of 694(it ended up slightly south of that for snowfall)....394 seemed like the dividing line between snow and no snow....but were talking mere miles....excellent job Randy. Dr. Novak thank you for all your knowledge and forecats thru the winter season....lets hope winter comes back sooner in the fall, say November. And Bill enjoy the warmth and sun and sandals. I also agree with Big Daddy. He nailed it. Randyinchamplain and Dr. Novak have been on all season. I would much rather watch them do the weather forecasts on our local tv's than the people who are on there now. But, then again, maybe they will be warped into thinking like the sweeps people think and have their brains altered from forecasting reality. That would be too bad. So.....until the next storm.....bring the warm weather. Can't wait. Time for the season to fully change. To Tom, Big Daddy and PWL, thank you for kind words, it was appreciated. My forecast for this storm was based 60% on the UKMET and 40% on the Regular GEM within 48 hrs of the event. Notice there is no mention of the NAM, GFS and Euro, (although I must admit 48 hours out the GFS ensemble forecast was strongly hinting at this). The difference was primarily seen at the 700mb level. Most of the models showed the strongest 700mb forcing being well north of the surface low located near Sioux Falls. However the UKMET was insistent that it would be much closer to the surface low. I went with that model when the 48 hour Reg Gem starting to hint at that as well. When we got within 24 hrs and the Nam started to slowly drift south with it's snowfall totals I pulled the trigger. Moral of the story, look at all models and decide what makes the most sense, not just focus on the NAM, Euro and the GFS. As a matter of fact, for most of this winter I was very disappointed in the EURO. Winter still not over?, NWS has chance of snow Friday night 4/25! Sure enough winter may not be over, Paul Douglas blog tonight shows the EURO model for next Sunday 4/27 with a cold rain turning to snow and a low of 29. What did we do to piss off Mother Nature? 12Z run of EURO continues to show major snow for 4/27pm into 4/28 for the area, 6-15" worth. How can the predicted high for next Monday be 52 and have a 20% chance of snow (NWS). Doesn't make sense unless they are talking about early in the morning. Even when it says rain and snow on the other days, it has highs in the 40s. I know it can and does snow when the temperature is above 32, but those seems like pretty big highs to even mention the word snow. The good Doctor Novak says doubtful for snow then, so nothing to worry about! But then again the snows we have received after spring officially started he hasnt zeroed in on till really close to the event. With all due respect, Anonymous, that's just not true. So whats this?.....more snow getting mentioned. I did a double take when reading the NWS forecast......they have snow in the forecast from Sat. night thru Tuesday.....although its 10%-40% as of now....but still to mention snow the last couple of days of April is crazy. Paul Huttner also mentions the Euro has a snow event for Tuesday next week.Crazy! Just plain old rain, lots of it and cool temperatures. You can put away the shovel and snow blower till at least November! Paul Douglas's blog tonight still hinting at at least a rain/snow mix Tuesday night into Wednesday morning.......says 'probably' no accumulation in metro but a couple of slushy inches up nnorth cant be ruled out! Thats a cold rain out there this morning......38° with a noticeable wind chill....definitely doesn't feel like April 27th. Paul Douglas's blog still mentions the potential for slush mid-week and the NWS discussion this morning says there is a chance of snow showers Mon. night/Tues. morning and Tues. night/Wed. morning....with this cold end to April it guarantees the 6th straight month with below average monthly temps, can't remember the last time that has happened. Yesterday's evening EURO run had a snowstorm stretching from all of SD into central MN including the north metro for May 6th! Unbelievable, I know its only one model and may not occur but it just tells the story of the unseasonably chilly air that will occur over the next 10 days! Yep, this blows! The average high for the last day of April(this Wednesday) is 65, some forecasts has us no higher then 40 on Wednesday. 25 degrees colder then normal, what spring! Two years in a row now that we have been screwed out of a spring. Feb - Nov 1993 (ten months) were all below average. Is it my imagination or is that sleet pinging at my window here in Maple Grove! Crazy weather! NWS discussion this afternoon states that it won't be a surprise if the Twin Cities has a snowy day tomorrow (Tuesday). Of course, we're not talking traffic snarling snow, but the fact that it might snow at the end of April tends to put a damper on thoughts of spring. Summer will probably come out of nowhere and spring will not arrive this year....again. Question: So the average high for this week is around 65 degrees. We have been at around 20 degrees or more below normal almost daily for about a week (or will be a week). Does this mean that we could have been, statistically speaking, 20 degrees above average for a week straight? That would mean that we would have been around 85 degrees for a week straight at the end of April. That seems unheard of, but maybe I am missing something. For all of you who know more than me, is this just as possible or does the atmosphere support one more than the other at this time of the year?? In 1980 April 17 to April 23 averged a high temp of 83 degrees, 24 degrees above normal. I think it can go both ways. If the distribution of the temperature is exactly normal then yes. One should plot the distribution of the 30 data points used for the daily average (NWS uses 30-year averages) and see its shape. it may be that it is skewed towards cold or warm in which case the probability of it being 20 degrees above can be different than it being 20 degrees below. I love this site and really enjoy reading all the regular’s contributions. I also am a little jealous about the warm weather you are enjoying. BUT I have to tell you that Monday night my wife and I were snuggled on the couch in front of the fireplace watching the Wild game. Outside the weather was horrendous with wind, rain, snow and cold temps. However we had deer at our feeder, a pasta dish and homemade bread in the oven and a great bottle of wine or maybe two. Life was not horrible. I get it that Minnesota weather is an acquired taste and not for everyone. But if you love it you really love it. I appreciate your comment and am glad to hear life was not so horrible. I guess part of it is what you've grown up with. (I grew up on the east coast where winter was essentially Minnesota's March.) I would say in the case of Minnesota's weather that a little goes a long way. Honestly, I'll miss some of the dramatic changes, but the long winter... man, it's just too much. I'm glad to hear you enjoy the site and those who contribute (obviously, I don't add a whole heckuva lot). Hope to keep it going even while I type from 2,000 miles away! I am starting to see a pattern change with the GEM/GFS and Euro models in the 8 to 10 day period. While the GFS is showing cape values close to 1500 at MSP on May 8th, the Euro and GEM keep them further south over IA based on where those models want to set up a warm front, ie: over IA instead of over southern MN. While I think the GFS is incorrect in its placement of the warm front, non the less it is a important development. By that I mean the next trough that enters the NW US could very well bring enough moisture north to effect us by say mid May. In addition, with a strong and consistent signal of colder air over Canada having a hard time lifting north, I believe their tornado season from mid June to mid August could be fairly quite. That could leave us in a very active pattern this summer. Now while some of you have seen me talk about Telleconections in the past when it comes to winter weather, they are not nearly as reliable during spring and summer as they are during the fall and winter. Therefore most of what I just said is more of a gut feeling than anything else, but unless something happens to lift that cold air over southern Canada out, we could see the baroclinic set up over the upper Midwest. Hope I'm wrong. Holly crap the 04/30 run of the Euro now shows surface cape values of 1500 over MSP and close to 3000 south and west of the metro, so things will be changing quickly if the 8 to 10 day model is correct. Having said that, I still think those values should be south of us. If they do verify than we will more likely be caped and need some strong forcing to break it, I'm not seeing it yet. In MN, we call Bill "Riff-Raff". I apoligise but for all of us amatuers who follow the pros on this site What did you just say? I get the holy crap but after that it is all Greek. Sorry it took so long to answer, but I wanted to wait awhile to see what the models were going to do with the system. CAPE stands for Convective Available Potential Energy, in a nutshell it measures the amount of instability that is in the atmosphere. 2000 to 3000 cape is highly unstable, readings above that are extremely unstable. Caped (think of it as a cap) means there is a warm layer above the surface that will inhibit lift from storms that to do try and develop, as they cant break through that warm layer, without some sort of mechanism that forces it through the cap. Having said that, referring to my post on 4/30 at 2:12am, the 05/02 0z of the GFS now shows the strongest CAPE Values south of us effecting Iowa and central and southern WI which makes more sense in regard to climatology, ie they normally will see a strong outbreak of severe weather before we will, the key word there is normally. Again colder weather is well intrenched in southern Canada just across the border. This system next week could well be a sacrificial lamb, as subsequent systems should bring higher dew points and thus higher CAPE values as we move into mid May. I agree with Randy. That Arctic air is simply too strong in so. Canada as it has been for several months now. This is causing major issues here in the Upper Midwest since it is delaying the onset of Spring & severe weather season. I don't see that changing anytime soon. The storm system next week will be a tease for MN as most of the energy (CAPE) stays south in IA, IL, so. WI. However, as we head into the summer months (June-August) don't be surprised if our severe weather season becomes unusually active. If this cool regime continues to dominate near & north of MN, a sharp & volatile boundary will set-up over the Upper Midwest as intense heat builds in the Plains states. With all due respect I do not see "delaying spring and severe weather season" as a major issue. It is actually a welcome development. Thanks Randy and Tom. You guys are really interesting. Randy your forecast on that last snowstorm was amazing. I am catching up on many of the weather terms but sometimes still struggle with the acronyms. I hope the site does not go to dormant in the summer I like the predications for when the heat will come. Again thanks for your predictions know that you have a lot of fans out there. At least we don't have to hear anymore winter terms for the next 6 months, man winter went on way too long again. As some of you know the SPC last night highlighted the area just SE of MN for severe storms for the Thursday time frame. They only update 4-8 day outlook once every 24 hrs and it normally comes out around 4am in the morning. My best guess is that when the update comes in the early morning hours of 05/04 that it will basically keep the same area highlighted, but will expand the risk area to include the Rochester area, but not the MSP metro. There's still a lot of question marks regarding the next few days and what severe potential they will offer. Even the weather service has their concerns about whether clouds will hinder enough heating for storms to pop and become severe, and where the warm front will set up. Pretty much all the models hold the warm front south of the cities until Thursday when it makes a rapid move to the north. All the models are generating a decent amount of instability and some ample shear for some storms to become severe. Thursday should end up being one of the warmest days so far of the year for a lot of us, and we should even feel the humidity out there too with dewpoints probably getting into the upper 50's and low 60's. Personally I'm a little surprised they are pretty much disregarding Wisconsin in the Day 4-8 outlook given parameters look to be more than enough for storms to become severe to the east of the river, but there will still be several adjustments made over the next several days. While we may or may not see a widespread severe weather event this week, at the very least some decent thunderstorms should roll through for most of us. Here's hoping there's no damage to speak of once all is said and done. I love storms, but would prefer to see them over an open field away from life and property. Welcome to spring everyone! Duane, based on the GFS 05/05 18z operational run of the GFS I agree with your assessment that western WI should be included in the risk area. That model run seems to show that the warm front should be just north of EAU to Green Bay at 18z Thursday.. With a sub 990mb low setting up just west of MSP, there should be enough lift lift in Western WI to fire off some storms. Type of risk is yet to be determined in my opinion.